I know I’m a little late to the game, but I wanted to reach out and wish you a great start to the New Year! Last year was one of the most rewarding (and busy!) years of my life, and I’m sad to see it go, but I’m looking forward to all the adventures that this year will bring. Make sure to visit my social media sites to keep up with live shows, new music, and band shenanigans! p.s. – Tune in for the last season of American Idol! Starts tomorrow night at 8 p.m. on Fox. You may see a familiar face! I’m officially playing on the same stage as Ed Sheeran…just not at the same time…sorry. But seriously, I’m really excited about an upcoming show that The Ragazzi is playing. 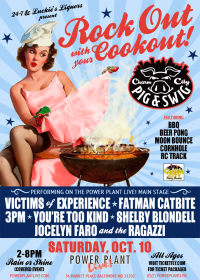 We’re a part of “Rockout With Your Cookout” at Power Plant Live! This event features local artists, plus barbecue, scotch, and (wait for it) a MOONBOUNCE! That’s all you should need to convince you. We’re all really five year olds on the inside, right? Anyways, join us on Saturday October 10 for this AWESOME show! Since my show on Monday, I keep getting asked the question “How was opening for Eric Hutchinson?” So I decided to write a little recap from that night. 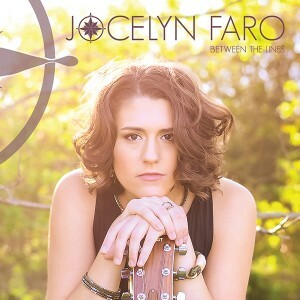 To start, I was REALLY excited to show off all my new merchandise which included a lyric racerback, a new “Jocelyn Faro” T-Shirt, and bracelets. I hadn’t put out any new merchandise since my CD release last year (side monologue: holy crap…it’s been a year) so I’d been working really hard on making products that I was proud of. Anyways, when I got there I started setting up my merch table, and Eric Hutchinson walks up, casually shakes my hand, and goes “hey, I’m Eric”. Totally cool, right? Chris and I thought so. 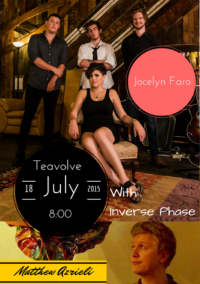 Come out for this FREE SHOW at Teavolve Cafe & Lounge featuring Jocelyn Faro & The Ragazzi, Matthew Azrieli, and Inverse Phase. Matthew Azrieli is a singer-songwriter from Montreal, Quebec who draws from artists like Elliott Smith, Nick Drake, and Bob Dylan. He is currently on a tour of the US, presenting his debut album “Chloe”. Scope-Mag states that “’Chloe’ is a touching collection, a diamond in the rough. This is what pop music should sound like: clear-eyed and emotive.” Don’t miss him while he’s in the area! After a few months of performing together, the band has decided to make it official. For anyone who’s seen us live, you know that I refer to the band as “my guys”. With that in mind, we named ourselves “Jocelyn Faro & The Ragazzi”, Ragazzi being a term of camaraderie or fellowship meaning “guys” in Italian. I’m looking fo rward to this next step in my music career, and I hope you are as well. Check out our official facebook page to find out more! Today, the band traveled up to Lancaster, PA to do a video shoot with Springwood Productions at Tellus360. Now, when you tell your friends that you’re doing a video shoot, their first assumption (and ours too, if I’m being honest) is “that’s not work”. I mean, we’re just playing music right? Wrong. So much wrongness. Imagine a room with eight people all moving around, no air-conditioning, with lights as huge as the sun beaming down on you for seven hours…it was hot. Let’s just put it that way. And heels? Soooo not my friends by the end of the day. But seriously, now that I’m done complaining, it was completely AWESOME! Tomorrow night, I’m playing a FREE EVENT (yes you read that correctly) at Metropolitan Kitchen & Lounge featuring Shane Guerrette, Angela Charles and of course me, myself, and I – well actually Chris, Minty, and I but that’s beside the point. This is a Songwriter Showcase hosted by Song Builder Studios, Reverbnation and Bill’s Music. TOMORROW NIGHT AT 6 PM! Have you gotten your tickets yet? ONLY $15!!! This is an AMAZING cause benefiting Youth Empowered Society (YES), hosted by Music Makes Life Better. 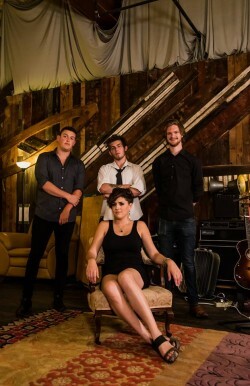 PLUS you’ll get to enjoy‪ live music including Crys Matthews, Keelan Donovan, and Jocelyn Faro. We could really use your help, and it’ll be a great time! I just joined Music for Good through ReverbNation. Every artist selling music on ReverbNation has the opportunity to choose a charity they’d like to support. For every download of my song Over You from ReverbNation, 50% of the sales price will be donated to Heifer International.